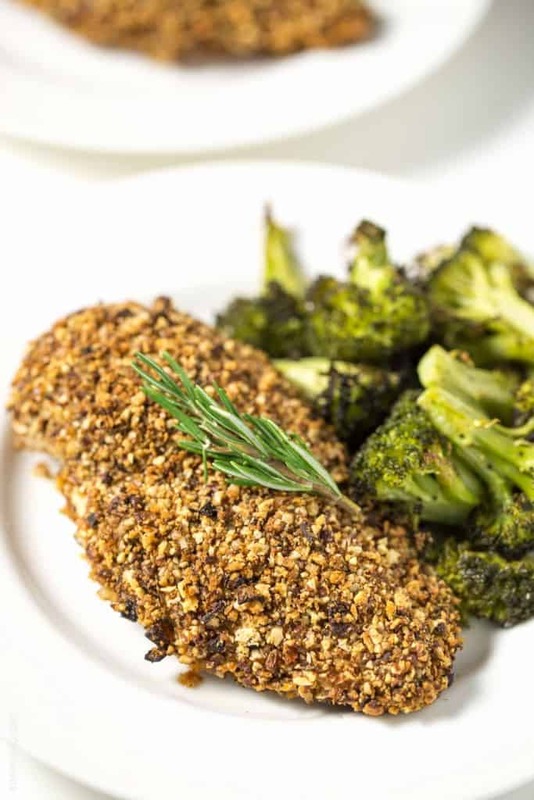 Quick and healthy rosemary almond crusted chicken breasts. Baked in the oven, and full of nutty flavor! Shawn and I have been going to this child birth class that our hospital offers to expecting couples. Along with being very informative, the biggest takeaway has been the crazy and whacky couples who are also taking the class. There is the couple where the husband is TERRIFIED about his wife’s water breaking. “If it breaks, do I have to clean it up? Oh, and we have a cat. What if my cat licks it up? Is that bad for the cat?” Oh my god mister, yes, you’ll probably want to help your laboring wife by cleaning it up. Preferably before your cat pounces on it. Then there is the couple with the husband who is TERRIFIED of watching his wife give birth. After watching a rather graphic video of a labor (um, the video showed allll of it), the husband raised his hand right away and said, “What if I get freaked out? Am I allowed to leave the room? And it seems like labor is going to take a long time. What if I get hungry?” The wife gave her husband quite the look after he asked that question. I would love to hear the conversation that took place in their car after they left. And I can’t forget about the ultra rich couple. The instructor was talking about car seat safety, and how the car seat always has to be in the back seat. The husband raised his hand and asked, “I drive a Corvette that doesn’t have a backseat. Can I put the baby in the front seat?” Um, no. Shawn and I looked at each other, and Shawn gave me this look where he barely tilted his head towards the guy and raised his eyebrows. It’s his “what’s up with this guy?” look that I know so well. I tried to hold it in, which only made my laughing fit worse. Which then made Shawn start laughing, which made me laugh even harder. Shawn and I are so not car people. If you paid me $1 million cash, I could not tell you the year or model of my car. I’m serious. I just know it’s an older Lexus. Could be a 2000? Could be a 2003? I think there’s an LX in the model name or something? No clue. And here this guys biggest concern is that he can’t drive his newborn around in his Corvette. The best part of the class is when the instructor turns down the lights and has the women practice their breathing while the husbands rub their back/shoulders/arms to help us cope thru contractions. After about 10 minutes, Shawn leaned down and whispered in my ear, “You tricked me and brought me to this class so you could get a massage, didn’t you?” Then he gave me a sweet little kiss on the forehead. He thinks he’s so funny. And then a woman who was 38 weeks pregnant accidentally farted during breathing exercises, and I had to pinch Shawn’s leg to keep him from laughing. Yes, we’re that couple who is laughing at everything. These classes have turned out to be the opposite of boring. You know what else is the opposite of boring? 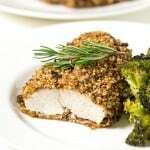 These rosemary almond crusted chicken breasts. I cook chicken for dinner at least once a week, and I’m constantly trying to find new ways to mix it up. Nothing worse than plain ole chicken! 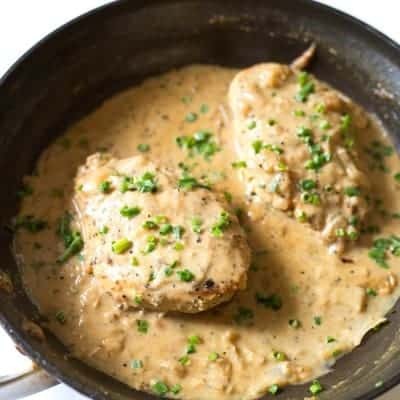 Past favorites have been this creamy mustard chicken, or my crispy baked pesto chicken parmesan, or the ultra delicious chicken mushroom fricassee. But I think we have a new favorite in our house. 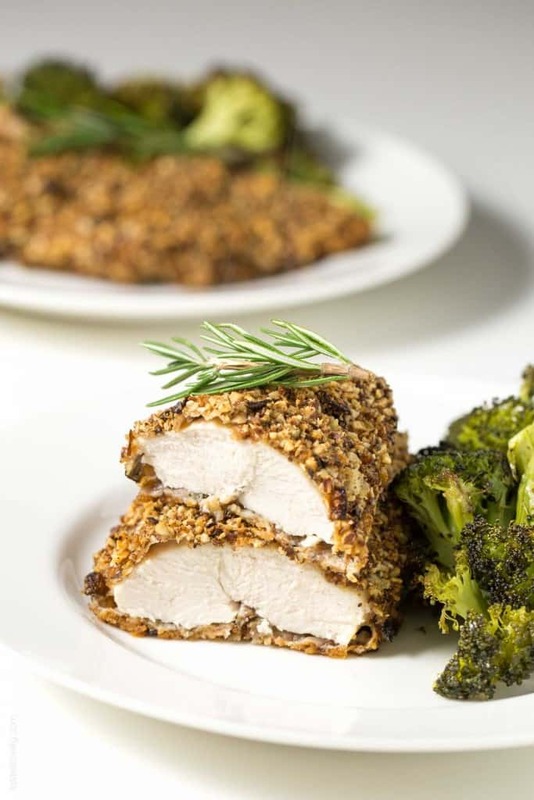 This rosemary almond crusted chicken is so delicious, and also so easy to throw together. It gets baked in the oven, which brings out all the nutty goodness from the almonds. It gives the chicken the perfect crunchy coating. And the rosemary gives a bright freshness to the coating. You could really substitute any nut for almonds. I’ve made this before with walnuts, pecans, even pistachios! Whatever nut I have on hand. But I must say, almonds are my favorite. Can’t beat that crunch! 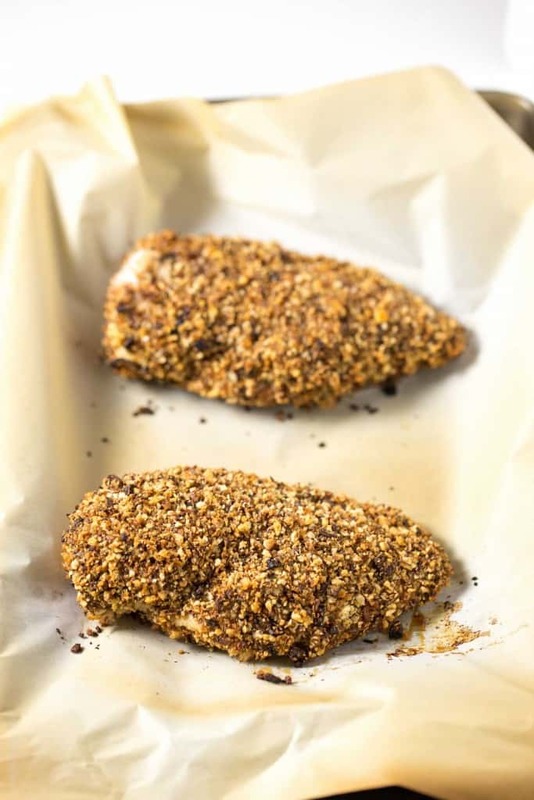 To bring the maximum amount of flavor and crunchiness to the almond coating, it is combined with panko bread crumbs, and then sauteed for a few minutes in a skillet with some butter and shallots. 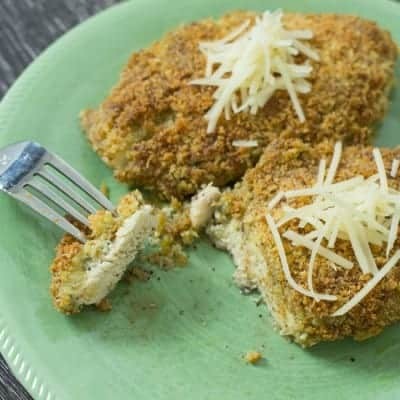 It takes a few more minutes, but this extra step makes all the difference in the chicken coating. Preheat the oven to 400 degrees with the oven rack in the middle. Line a baking sheet with parchment paper. Season the chicken breasts generously with salt and pepper on both sides. Set aside. 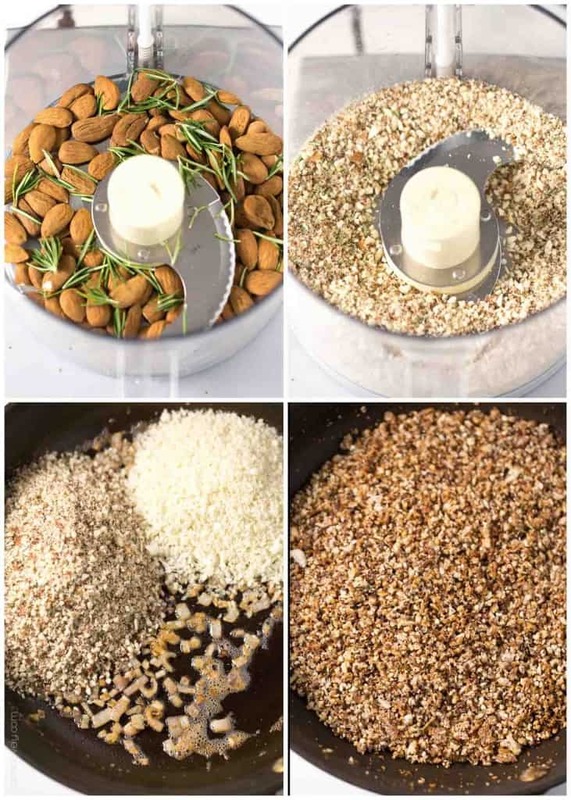 In a food processor, chop the almonds and rosemary until they resemble course crumbs. Set aside. Heat a medium size skillet over medium heat. Melt the butter, then cook the shallot until it begins to soften, about 3 minutes. Add the rosemary almond mixture, panko bread crumbs, and salt. Cook, stirring frequently, until golden brown. About 5-10 minutes. Remove from heat and transfer to a plate. Set up your dredging station. Have 1 plate with the all purpose flour, another plate with the beaten eggs, and the 3rd plate with the toasted rosemary almond mixture. Dredge the chicken in the flour, then in the egg, then in the rosemary almond mixture. Press well to adhere the rosemary almond mixture to the chicken. 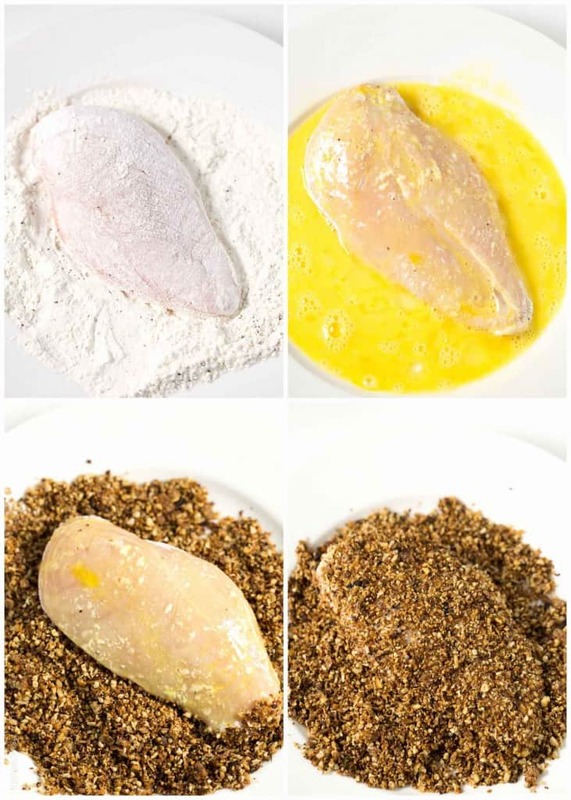 Transfer the chicken to the parchment lined baking sheet, and repeat with the remaining chicken. Bake the chicken in the oven until the internal temperature is 165 degrees, about 25 minutes. Serve warm. I love this meat thermometer to make sure I am cooking meat to the correct temperature! Oh my goodness!! Haha! I love all your birth class stories, girl! Seriously cracking up over here. :D And this chicken? Um how did you know that almonds and rosemary is one of my FAV combos?? Needless to say, this chicken is so happening! Oh my, Natalie! No shortage of episodes to make you two laugh! I bet y’all anticipate what’s next during class… who will do what! LOL! It’s like anticipation in a movie… and laughter is so good for you, and your little guy feels the joy too! I love your rosemary almond crust… Just delicious! Hahahahaha! Oh my gosh, what a crowd! When I start giggling I CANNOT stop. I can only imagine what I would have been like in there too! I am loving this chicken, Nat! That thick crust is to die for! OMG friend, your parenting classes are as funny as mine. Me and my husband just laugh all the time. I loved to hear your stories and I was planing to write a post to talk a little bit about it too. Oh goodness…birth classes. Those and hospital tours really give you an up close and personal look at people, don’t they? This chicken looks so good! That crust…yum! Okay, I was totally cracking up at your birthing class stories. That is so hilarious! I feel like even if you didn’t get anything out of the class, it would be worth going just for the entertainment value!! 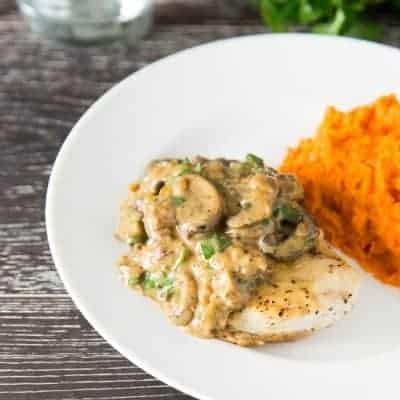 This chicken looks to die for – I love finding new ways to make plain old chicken super yummy and interesting! I never got to go to childbirth classes, and now I feel like I missed out!! I got a good laugh over those stories! This chicken looks SO easy and delicious! I love that crunchy coating! Haha your class sounds like a hoot! Ours were actually pretty boring – I think the most excitement we had was a heated debate between two couples who had opposing opinions on whether they should find out if they were going to have a boy or a girl. Ah good times :) Love this chicken! It looks so crunchy and delicious! Your classes sound hilarious! You and Shawn sound like the cutest couple around :) And this chicken sounds fabulous!! That crust is everything I want and more. Whoa… this chicken looks amazing!! Also, that class sounds hilarious! Although, I feel like I would be more freaked out than that guy after watching a video like that. Bahahah!!!! This is the best post ever Natalie. why is it that all the crazy comes out of people when they are having a baby? Or in these people’s case, the idiocy and farting comes out. lol!! That sounds delicious! I want to try adding in walnuts and cashews like you did next time I make this! Amazing! A favorite in our house. Thanks Jane! I’m so glad you like it! Means the world! 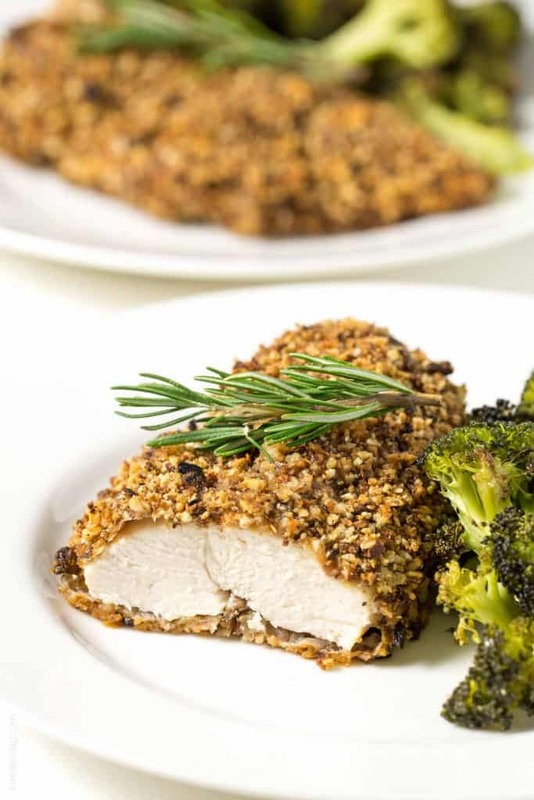 Absolutely delicious, and is a great changeup from standard panko breaded chicken. So glad to hear you liked it Eric! Thank you!